we asked her 10 questions. 1 - where do you live and work? I actually live in two places; my workshop is next to the home I grew up in, in a remote part of Mid Devon. I spend around 3 days a week hiding out there making orders. The rest of the time I live in Bristol where I do the finishing and packing and internet/email/research side of my business. It sounds like a funny arrangement but it suits me so well. It means when I’m in Devon I can focus solely on making and take myself away from any other distractions. When I’m in Bristol, I can be a lot more relaxed and fit my work around doing other things. 2 - what did you study and where? I studied 3D Design at Camberwell College of Arts in London. The course was practical and structured around a large amount of workshop-based experimenting time which suited me well as a maker. Also the class size was small - this meant not only did we get excellent one-to-one help from tutors but we got to know each other as a class really well and frequently worked on projects together. Living in London was exciting, having come from the countryside it was a bit of a culture shock but I loved it. 3 - how did you decide that ‘wood’ was your thing? My parents bought a sawmill in Devon when I was 6. I used to make many boxes from the offcuts, some of them turned into bird boxes. I became very used to drills and hammering nails and saws and the smell of sawdust, it was just a normal part of my home-life. I went through school with no specific interest in becoming a woodworker. I applied to do a foundation diploma in art and design in Bournemouth and I discovered an enjoyment of experimenting with different materials. I never thought of myself as an artist as such, and my painting and drawing skills were not very impressive but I discovered working in 3D was something that really excited me. I found my way back to woodwork while studying at Camberwell. I think it was the smell of sawdust in the workshop that reminded me of my childhood in Devon. 4 - what made you decide to start your own business rather than get a job? I didn’t start my own business straight away and I did various jobs in London but I found it hard to enjoy working for someone else all of the time. 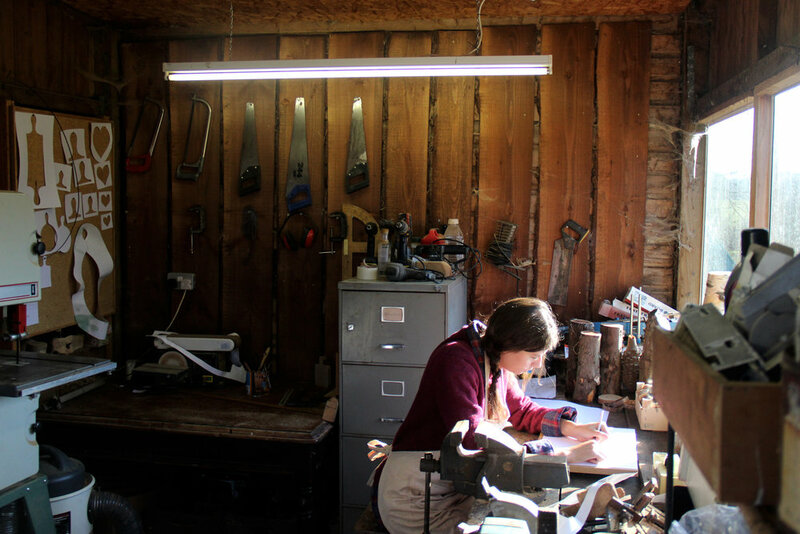 I always kept up my workshop in Devon and began to go there more and more, it got to the stage where my jobs in London were holding me back as I simply didn’t have enough time to make things. I had always thought about being self employed and so I moved back home and booked myself into my first trade show. Since then I have been pretty consistently busy with orders. I am still fairly new and learning all of the time. At the moment I am happy just to earn a living from doing what I love. 5 - what motivates you? It is scary and exciting to be completely self-employed but I love how varied my work is and I have never enjoyed work more. I enjoy every part, from sourcing the wood and coming up with designs, to the sawing and sanding and oiling. I love the final stages of fastening labels and packing up an order to send out to. During this whole making process I form an attachment to all of the pieces I make and it is sometimes hard to let them go. However the constant pressure of this being my income means I quickly have to get over that sentimentality although I do sometimes think about every board I have made and where they are now. 6 - what excites & inspires you? I am inspired by many things, the wood itself, how each tree is different, even within species, the grain varies so much. This adds that unique part to each piece I make. I also find it inspiring to see what others are doing and this really motivates me to create interesting work. I fairly recently joined instagram and my feed is full of other makers, woodworkers and carvers. I've long been an admirer of David Nash and his amazing wood sculptures. I have followed Brooklyn-based woodworker Ariele Alasko for a number of years. She is inspiring, not only because she is also a woman in a largely male-dominated trade, but her work is stunning and I love the variety of her work. When you turn your hobby into your job it is so important to keep things varied. I am always on the lookout for inspiration of new products to make. 7 - what does your average day look like? I would love to say I am a morning person and get up at the crack of dawn every day to work but this would just not be true. I don’t set an alarm but wake up between 8am and 9am. I have a leisurely breakfast and use this time to think about what I need to do in the day. If I’m in Devon, I will have a printed list of orders I need to make. If I am in Bristol, I will check my emails and catch up on other admin. I often work until nearly midnight. I just fell into this habit and have given up trying to stick to ‘normal’ working hours. I get so much more done in a couple of hours in the evening than I do all morning. 8 - how do you unwind and let your hair down? When I am working I frequently spend all day with just my cat for company. I do love my own company, I grew up an only child and am perfectly happy to be by myself, but I am a social person and really enjoy spending time with others. I am really into cooking and learning new recipes and love hosting dinner parties. Currently my favourite thing to do is look after my vegetable garden in Bristol. It is such a rewarding hobby and growing your own food is the most satisfying thing. At the moment I am enjoying spending time in the sunshine with friends and possibly drinking the odd G&T! 9 - what is on your ‘to do’ list of dreams? I always had this idea that one day I would like to have my own bricks-and-mortar store somewhere, my workshop would be around the back and in the shop I would practice my woodcarving skills and sell handmade objects made by myself and other makers. 10 - what is your most treasure possession? I have many objects and possessions which mean a lot to me for various reasons but I think if I had to choose a favourite it would probably be my passport because of the freedom it allows me to travel anywhere in the world.